Sequels are a tricky affair. Across the border they’re immensely popular as producers and actors try to cash out on a popular franchise as much as they can. But most of the times, they tend to fall flat – case in hand Race 4. 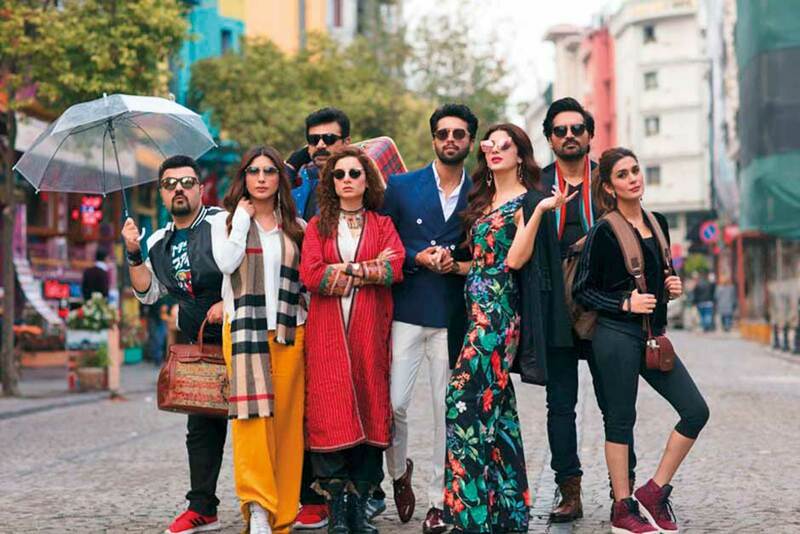 When Jawani Phir Nai Ani 2 was announced, fans and audiences were ecstatic at the return of the crazy four who had us in squeals of laughter with their comical antics and witty one-liners. However, the sequel was announced with Fahad Mustafa instead of Hamza Ali Abbasi and we have to admit, we were slightly heartbroken at that. Nonetheless, the trailer was released to mixed reviews with many commenting that it had too many takeaways. Personally I loved the trailer, especially all the glamour it had and here I will say that as expected Nadeem Baig did not disappoint. Vasay has proven once again that as a writer and comedy actor he is brilliant. No one can match his comic timing, expressions and ability to make everyone laugh with just one gesture. His writing abilities are excellent and the way he has woven present day narratives into the film deserve a round of applause on their own. The entertainment and humour quotient was slightly missing in the sequel but there was more drama, glamour and romance which made up for it. Moreso, another noteworthy thing was that the film did not hurt anyone’s sensibilities and kept in mind the current cultural-shifts. The chemistry of the trio Ahmad, Humayun and Vasay was brilliant as always and Fahad easily joined their gang without faltering. Though there were certain points where we missed Abbasi, Fahad with his expressions and body language made up for it. Abbasi also made up for his absence with a short cameo which suited him perfectly. The rest of the cast was also well-connected and not a single character was out of place. The director made sure that each one of his actor put forward their best performance. As far the ‘bad’ of the film is concerned, the only qualms I had was the length of the film and fact that the female characters did not get enough time to shine. Though each of the female leads looked absolutely glamorous with their stunning costumes, hair and makeup, I wish they had more screen time. Out of the female leads, Kubra had the most screen time but her character was a little dull. Mawra was also a good addition to the film and she nailed her character of a spoilt, young heiress. However, Sarwat and Uzma were entirely missing post-interval and I really would have liked more of Gul’s sarcastic comments. Furthermore, the film could have done without some scenes, such as Sara Loren’s song. The filmmakers termed the song as a cabaret, but it was essentially an item number. Despite, the song and its catchy tune, it was really not necessary. Nonetheless, the film was a visual treat with its stunning shots and cinematography and Baig has proven once again that as a director, he is truly an asset for our entertainment industry. He brought out the best in his actors and ensured that their performances were on par. The film’s scenes and subplots were well-woven together and captivated the audience’s interest throughout. The most difficult part of a sequel is binding it to the previous film and Baig did that beautifully. The flow into the sequel was extremely natural. Essentially the film has all the ingredients necessary for a rom-com, so hit the cinemas and step onto the rollercoaster as JPNA’s Fantastic Four take you on yet another mad caper.